In early October a Smithfield, North Carolina car wreck killed a woman and injured pedestrians in a parking lot. 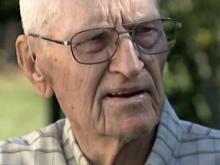 95-year-old Benjamin Moye was the driver responsible for the car crash. He was looking for a parking space in front of a Smithfield Walmart when his foot slipped off the brake. Moye's truck collided with Jeanna Hawley, her mother and her grandmother's friend. All of the women were hospitalized and the friend of Hawley's grandmother did not survive. Moye was charged with misdemeanor death by motor vehicle. If convicted he will face a potential of 120 days in jail and a one-year mandatory revocation of his license. As one of the victims, Hawley believes a jail sentence is too harsh and wishes that Moye's driving privileges be revoked permanently. Hawley hit the ground face first and suffered torn muscles and fractures in her legs along with road rash. Both sets of wheels on Moye's truck ran over her and her mother. WRAL reports she is having recurring nightmares since the car crash. Her grandmother's friend did not survive. Just a month before the Smithfield crash, the media started buzzing with an elderly driver debate because of Hollywood's accident when an 84-year-old driver hit Oscar-winner Reese Witherspoon. Many people are hoping states will start new requirements for vision tests and road exams for older drivers. Statistics of senior citizen drivers confirm there is a higher risk of fatality, according to AAA. In Chapel Hill, recent reports show that there are just as many people over the age of 55 as there are under the age of 18 in Orange County. Accident attorneys at Brent Adams & Associates handle cases for injuries or wrongful death caused by car accidents in NC. If you or someone you know was injured because of an elderly driver's negligence, contact a car crash lawyer in Raleigh, Fayetteville or Dunn with Brent Adams & Associates. Like us on Facebook to hear about the latest personal injury cases in NC.